The 2nd episode of our modding tutorials serie is up! In this episode you will learn how to create a realistic and high quality banner pack for your favourite team! The beginner banner tutorial lasts until 5:05! After that you will see the advanced tutorial on how to make the rest of the banners! 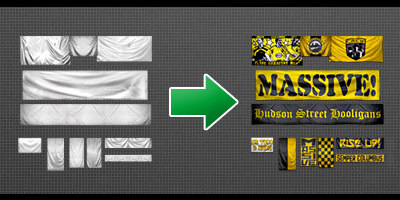 Bellow you can download the Banner Tutorial Materials and the “How to import in FIFA 13” guide. In the pack you will find a pack of textures, banner models, banner templates, a PSD for generic waving flags and more tips on banner making. can u make a tutorial for the turf ??? I used Adbobe Photoshop CS5. But you can make banners with any version of Photoshop. For your kits league logos issue there is only one tool that can do what you want: Revolution Mod 13. Of course you will need to modify the kits yourself and add the league logos on their jerseys.